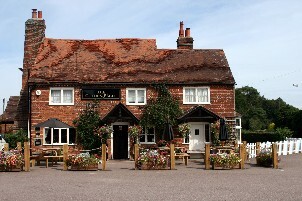 The Golden Eagle is a typical Engish village pub serving a wide range of Ales, Lagers. Wines and Spirits to suit all tastes. It has a child-safe rear garden, plenty of parking space and with walks to the local Farm Shop in Johns Lane through the local woodlands. Paul and Viv Burgess (who also run the "George and Dragon" in Northchurch).will head up the team. Jack and Zoe will come to be our live-in Managers, and their chef will be Tim.